While dispensing fluids, the tip of the nozzle may collect a small deposit of fluid that could affect the consistency of dispense. Our automated nozzle cleaner can remove this drop of fluid ensuring a consistent dispense process. Nozzle cleaning is done prior to the automated nozzle calibration routine, and can be programmed for the beginning of a program or at any time during a program. Systems with multiple dispense heads can benefit from multiple nozzle cleaners. 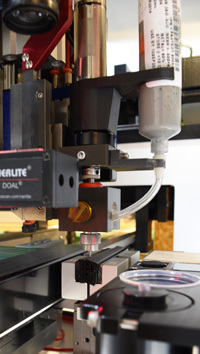 Using multiple nozzle cleaners avoids potential contamination of a nozzle with a foreign fluid (non-conductive glue and conductive glue, for example). 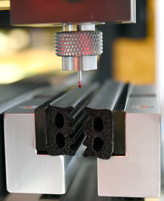 Clamp nozzle cleaner is standard with all GPD Global automated platforms. It uses a contact method that envelopes the end of a nozzle. 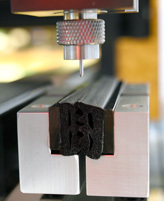 When nozzle is retracted, a wiping action is created leaving a clean nozzle tip for the dispense process. 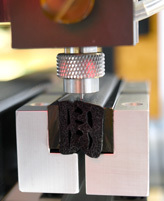 The nozzle moves incrementally along pad length to avoid nozzle contamination. System notifies operator when needle reaches end of its pad length. 1. 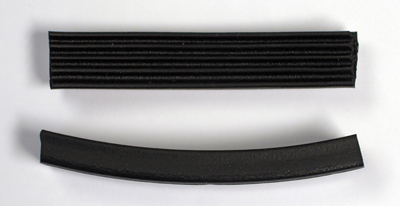 Needle, with a "blob" of material, descending into the Grip Type Needle Cleaner. 2. 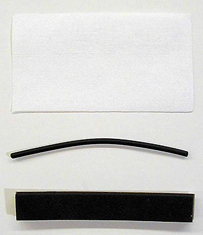 A 3.2" (81 mm) length of wiper area is available to provide numerous clean needle wipes prior to cleaning or replacing the disposable jaw parts. Needle Cleaner tool-less design makes changing wipes very easy. Simply remove magnetic pad holders, remove old pads, and insert new ones. Multiple styles of wipes (pad, paper) are available. Pad style needed depends on type of fluid to be cleaned. Vacuum Nozzle Clean/Purge is recommended for NCM5000 Jetting pump. NCM5000 Jetting pump doesn't use conventional needle-type dispense tips, so vacuum is the best way to clean nozzle tip. The vacuum nozzle clean/purge device is integrated into calibration station. Vacuum pulls fluid from pump tip into a tiny purge cup. Vacuum nozzle clean/purge also works with standard types of needles. Use of vacuum nozzle clean/purge is optional for Precision Auger and Volumetric PCD pumps. In some cases, you can use both vacuum nozzle clean/purge and the clamp nozzle cleaner. For fluids that tend to wick up nozzle side, use vacuum clean/purge to keep needle clean during the purge process while still using clamp nozzle cleaner. Vacuum Nozzle Clean/Purge - video.